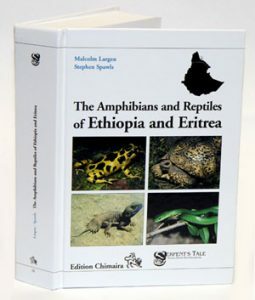 The amphibians and reptiles of Ethiopia and Eritrea. Artist/Author: Largen, M. and S. Spawls. This book is the first attempt to summarise what appears to be known about the amphibians and reptiles of Ethiopia and Eritrea in a single volume. Much of this information is already available in scientific journals however the pappers are widely scattered and often technical. 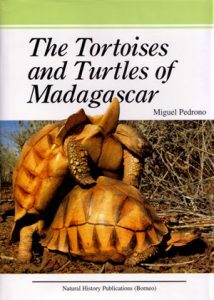 The tortoises and turtles of Madagascar. Madagascar has a rich and diverse reptile fauna including several species of chelonians that are found nowhere else. It is home to such spectacular species as the Radiated tortoise, Astrochelys radiata, the Spider tortoise, Pyxis arachnoides, and the Ploughshare tortoise, Astrochelys yniphora; which is considered to be the world’s rarest tortoise and one of the most endangered reptiles. This is the first book to cover all the living and extinct chelonians of Madagascar. This book is an authoritative and comprehensive guide covering every known aspect of their natural history. Recent field studies that have been carried out by the author and others to provide a better understanding of these species’ ecology are synthesised in this publication. Practical species accounts provide accurate details of species identification, distribution, ecology and conservation, and are complemented by numerous beautiful photographs of Malagasy tortoises and turtles in the wild. Up-to-date information on the status of their populations is also presented, and there are details on the best sites to observe tortoises and turtles in Madagascar. Currently all extant endemic species of tortoises and turtles of Madagascar are threatened and the rapidity with which chelonian populations have declined in Madagascar underscores the need for equally rapid action to protect them. This book outlines the challenges to chelonian conservation in Madagascar and the approaches developed to date to facilitate their recovery. This book will not only introduce readers to the fascinating world of Malagasy chelonians but will also raise awareness and support to ensure that they are preserved for the future. A guide to the reptiles of Southern Africa. Artist/Author: Alexander, Graham and Johan Marais. 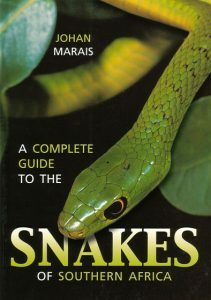 This title is intended as a companion volume to A complete guide to the snakes of Southern Africa [see stock id 19699]. It features the 516 reptile species for the subregion (27 tortoises, 337 lizards, 151 snakes and one crocodile). 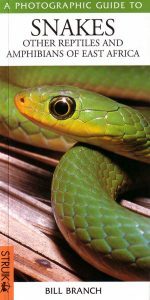 This book covers the distribution patterns of southern African reptiles; the diversity of reptiles; the biology of reptiles; behaviour; finding and observing reptiles; and snakebite. A field guide to the amphibians and reptiles of Madagascar. Artist/Author: Glaw, Frank and Miguel Vences. Completely updated and rewritten edition. 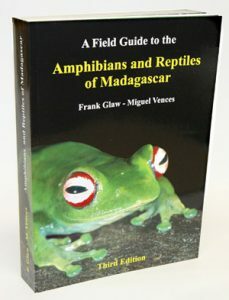 Includes biology and description of all Malagasy amphibians and reptiles. Accounts and distribution maps for over 700 species and more than 1500 colour photographs. 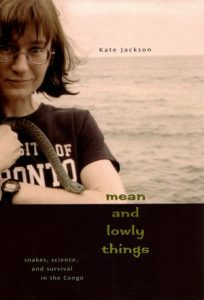 Harvard-educated herpetologist, Kate Jackson set up her tent in a pygmy village, and went to collect Central African snakes, lizards and frogs. This text describes her struggles to learn Central African customs, overcome labyrinthine bureaucracy there, fit cobras into small backpacks and convince locals that she is a scientist and not a witch. Artist/Author: Broadley, Donald G. et al. 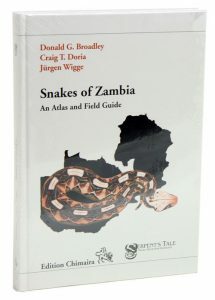 This atlas and field guide provides an introductory chapter on zoogeography showing the variety of habitat types of the Zambian snake fauna. A series of keys has been compiled to assist in the identification of all Zambian snakes, these are supported by figures showing diagnostic arrangements of head shields and more than 160 photographs. Natural history notes are included, as well as available data on captive care. A comprehensive chapter on snake bite treatment compiles the available knowledge on envenomation and medical care in Zambia and other African countries. 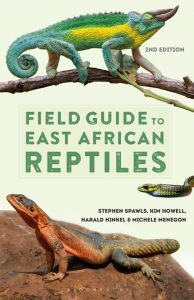 Part of the well-known Photoguide series of books on African natural history, this guide covers the most common snakes, lizards, skinks, chamaeleons, terrapins and amphibians (frogs) of East Africa – covering a total of 260 species. The aim is identification and each species account features a brief text that highlights diagnostic features, a distribution map and a colour photograph. Artist/Author: Spawls, Stephen, et al. 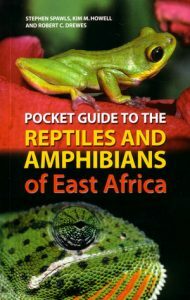 Covering the prominent 150 reptiles and 80 amphibians found in the region (Kenya, Tanzania, Uganda, Rwanda and Burundi), with concise text, photograph and map for each, this is a pocket guide for a diverse and often conspicuous and attractive group of animals. 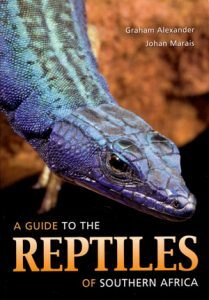 This is a lightweight and portable guide, partly adapted from the popular and highly acclaimed A field guide to the reptiles of East Africa [stock id 19627] by the same authors. This detailed and comprehensive guide to the 151 snakes indigenous to southern Africa covers all essential aspects of snake biology and behaviour. This edition has been updated, revised and expanded to include at least 11 newly discovered and 30 re-classified species and sub-species. New information based on international scientific research has been included in the species accounts relating to behaviour, identification, reproduction and snake venoms. For companion volume Field guide to reptiles of Southern Africa [see stock id 27417].